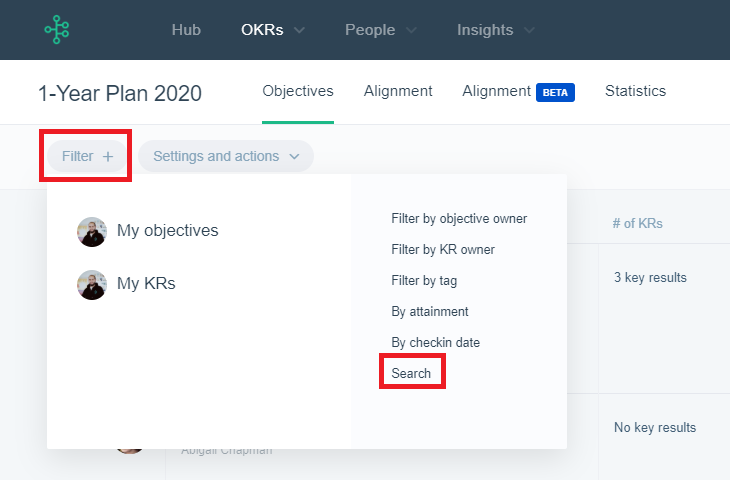 To make it easier to navigate and access the information you need on the spot, you can use the different filters and the search options available in the OKRs > Browse/Manage sessions > Choose a respective session > Filter + Search buttons. Tip: recommended for team OKR retrospectives! And when there're cases when an objective is owned by one person or team but some of its key results have a different owner, then you can use the Filter by KR owner. Here you have two options: filter by employees or teams KR owners. check-in date: when the regular check-in meeting comes, you'd like to know who hasn't updated their OKRs recently so you can have a chat with them and see how to help. You can also perform a quick search by any word. For example, if you want to check if someone has created an OKR for specific research, you can type "research" down and see what comes up. And to top it all off, filtered or not, you can export the OKR list to excel.